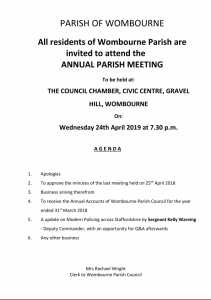 All residents of Wombourne are invited to attend the Annual Parish Meeting taking place on Wednesday 24th April at 7.30pm in the Council Chamber. 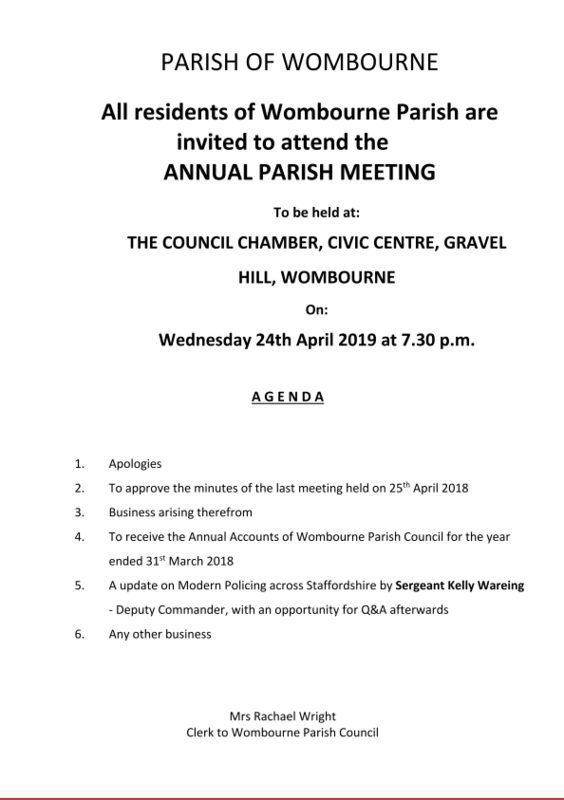 The guest speaker this year is Sgt Kelly Wareing who will provide an update on modern policing across Staffordshire and answer any questions you may have. The full agenda can be found at the bottom of this page. There can be, and often is, confusion between the Annual Parish Meeting and the Annual General Meeting of the Parish Council. 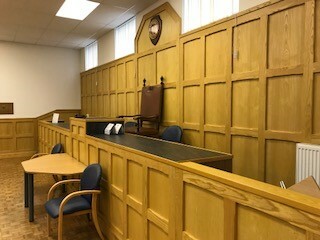 All Parish and Town Councils throughout England are required by law to hold an Annual Parish Meeting, which must take place between 1st March and the 1st June (inclusive). Meetings should not commence before 6.00 pm. The meeting acts as an annual democratic point of communication enabling electors to have their say on anything they consider is important to the people of the Parish. The Annual Parish Meeting is a meeting of all the local government electors for the Parish, which the public are entitled to attend and participate in. Will I be able to ask questions and make suggestions? Yes, any registered elector may ask questions of the Council, which will usually be answered by the Chairperson or a designated Councillor. An elector may also make suggestions and comment on anything relevant to the residents of Wombourne. The Chairman of the Parish Council will chair the meeting or in his/her absence the Vice Chairman. Will Parish Councillors be there? Yes, however, the purpose of the meeting is to enable the ordinary electors to have their say. Councillors will listen with interest and as electors themselves, also have the opportunity to raise questions and make comments if they wish. Will notes be taken of the meeting? Yes, a written record of the meeting will be taken and presented at the next Annual Parish meeting for approval. What else happens at the meeting? In recent years we have invited guest speakers, in 2018 Matthew Ellis, Police and Crime Commissioner for Staffordshire attended and this year, Sgt Kelly Wareing will be in attendance. Generally the meeting will last no longer than 1 hour.